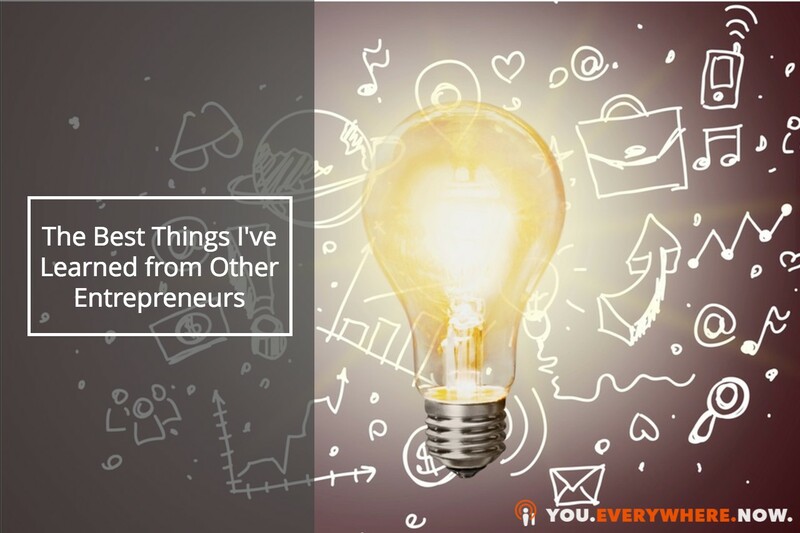 I'm going to share with you seven of the best things that I've learned from other entrepreneurs. These are the things that I study, model, and use daily to help me earn more, live more, and give more. These are all people that I know, I've worked with in some way, shape, or form, and I've modeled and implemented what they've taught me in my own business. Darren Hardy and me on set. The first person on my list is my friend Darren Hardy. For years he served as the publisher of Success Magazine. He also impressed upon me over and over this notion of creating an impeccable brand. It's so easy to get into the trap of thinking you have to create, create, create, create, create. Instead, simplify, simplify, simplify, and create an impeccable brand. I guarantee you there's no way to create an impeccable brand if you're constantly chasing your own tail and making too much stuff. Tony Robbins and myself on set. The next big idea came from Tony Robbins. Years ago, I was out at his house in Palm Springs, California, helping him set up his studio. I was hooking up some equipment so he'd be able to make his videos and distribute them to his community very easily. I can remember when we were all done with the work, we sat down for part of the day and he shared one of these many words of wisdom with me. Part of what he was talking about was the fact that just spending time with him gave me an immense amount of brand power because I was able to talk to Tony on a regular basis. He's a guy who's connected with a lot of people. Just being around thought leaders or celebrities automatically boosts your value as well. John Assaraf on Episode 005 of the Mike Koenigs Show. I can remember the first time I heard that I thought, “That's crazy.” John's whole idea is, if you're comfortable, it's probably because you're too smart. If you don't feel challenged, or you don't feel out of place, you've got to examine that. What he constantly does is look for people, environments, and situations where he can really learn. John likes to think of it as “baptism by fire.” In other words, you've just got to get in there and do it even if it makes you feel really uncomfortable because very often that's the way you're going to grow and expand your mind. He talks about neuroplasticity, the whole idea of the older you get the more rigid your brain becomes. If you want to be flexible, you've got to think flexible too. My good friend J.J. Virgin. J.J. Virgin is a multiple New York Times best-selling author and a very good friend. I was just with her the other night, and she had a really, really great point of view. It was about knowing when to quit for now. If you're successful in any way, shape, or form, opportunities are thrown at you all the time. At some point you've just got to say “Yes,” or “No,” because they're going to take energy and time away from you. I was recently involved in a very big project with J.J. It was something that had a lot of potential, but something else popped up for her. It was literally the opportunity of a lifetime. It had massive possibilities, massive opportunity to grow her brand, her visibility, and something called her platform (her ability to just reach more people). She ended up cutting out a whole bunch of stuff including one of the projects that we were working on because it just made so much sense. It wasn't for forever, it was for right now. Every so often, entrepreneurs find it very difficult to let stuff go. Sometimes, just simplifying is the key to success. That brings us to the next one by Gary Vaynerchuk, a guy I deeply respect. He's managed to build a great business for himself in the media world and he's also a real innovator. My interpretation of it is that turtles always win and rabbits usually wear themselves out. You look at turtles, there's longevity at work here and they get to where they want to go. By playing the long game, you aren't worrying about simple wins that are just money driven or whatever that short-term viewpoint is. This is the problem with the quarterly mindset that Wall Street has, for example. I think looking at, thinking about, and playing the long game is really valuable and important. I don't even know who originally came up with this because I've heard it from so many people, but it's always be marketing, ABM, and always be selling, ABS. When I look at my biggest mistakes, it's when I'm not marketing and I'm not selling all the time. The whole idea is you want to get that selling and marketing machine going all the time. The last piece of advice actually comes from me. This comes from about 30 years, in the trenches at this point. I know that isn't a great way to end this, but the bottom line is this, you've just got to remember to have fun while you're in the process of being an entrepreneur and use these principles as guidelines. Give yourself the ability to fail because failure just means you're learning, and as you're rapidly failing forward, it means you're getting ahead. Just like when a plane is navigated by its pilot, there's no such thing as a straight line, just a lot of quick turns and twists, and that's part of being an entrepreneur. What is the best advice you've heard? Leave a comment below. If you want to learn how to gain access to celebrities, fame, and credibility, click the link below to download my entire best-selling book Publish and Profit and learn how writing a book can change your business and your life for the better.